I cannot recall when it happened, but it was not recently; not last week, last month, nor even last year. It happened gradually, of that I’m sure. It has something to do with survival, but the details are somewhat vague. It most likely – no, it definitely got its start — with my ancestors thousands of years ago. It’s in my DNA.This fixation on and love of birdsong. Avian songs are sounds, sometimes melodic, sometimes not, used in communication during the breeding season. Birds produce lots of sounds throughout the year, but their actual song has an important purpose. They don’t sing because they are happy. The male sings to attract a mate. The male sings to stake out his territory — stay back or face the consequences! In some species, the female sings. In some species, the pair sing a duet. Spring means new life and birdsong is a precursor to new life. Personally, as a lifelong nature lover and birder, an essential spring ritual is to welcome back the migrant birds that return each year. Not a physical welcome, per se, but a welcome back — into my heart and soul. The return in spring of our migrant breeding birds is a time of hope and rebirth, and their songs give me joy, comfort, and hope. Joy — that such wonders even exist and that they have returned again! Hope — that things aren’t as bad as they seem. Hope — that the world is going to heal. Comfort — in knowing that Mother Nature will survive, even as humans may not. An early-morning visit to a swampy woodland on a sunny April day stimulates the senses. 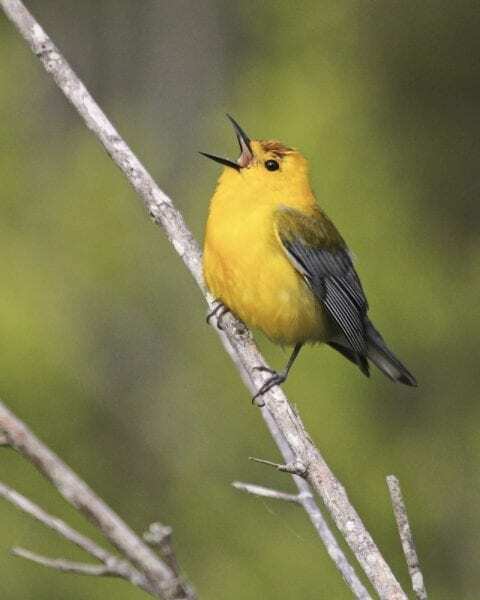 A flash of yellow, as a Prothonotary Warbler darts through the brush and nabs a spider! The buzzy song of a Black-throated Green Warbler emanating from the top of a bald cypress, just budding out in new spring growth. The splash of a yellow-bellied slider as it drops from its sunny log back into the cold, dark water. The heady perfume of a blooming Carolina jessamine, snaking up into the trees, seeking the sun. Bumblebees hard at work — always at work — busy as bees. A Barred Owl calling in the distance! How cool is that? This, my friends, is Eden. Right in our backyards. Enjoy it, respect it and protect it. A great variety of neotropical migrant warblers arrive in Dare County this month to nest. Look (and listen) for: Ovenbird, Worm-eating Warbler, Black-and-white Warbler, Prothonotary Warbler, Hooded Warbler, Northern Parula, Yellow-throated Warbler, Prairie Warbler, Black-throated Green Warbler and Swainson’s Warbler (if you’re lucky), in addition to the permanent resident Pine Warbler and Common Yellowthroat. Several species of these feathered jewels can be found in Kitty Hawk Woods, Nags Head Woods, and Buxton Woods; all can be found on the Alligator River National Wildlife Refuge. Ruby-throated Hummingbirds will show up in full force and be easy to find as they zip from flower to flower. 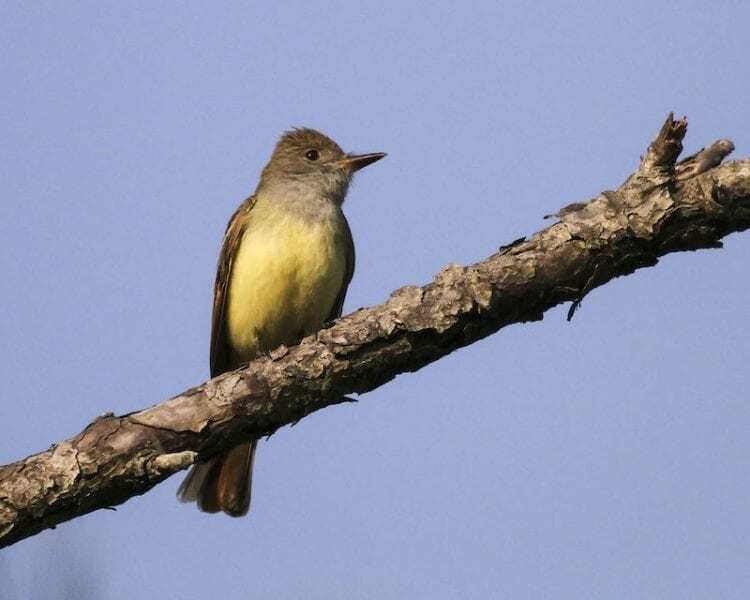 Keep an eye out for White-eyed Vireo, Red-eyed Vireo, Great-crested Flycatcher, Eastern Kingbird, Red-headed Woodpecker, Indigo Bunting, Summer Tanager, Orchard Oriole and Chimney Swift. They all return this month, some to wooded habitats, others to more open terrain. In wet areas, Green Herons should be stalking frogs and fish and looking for a suitable spot to build a nest. Also near the water, look for returning Purple Martins, Tree Swallows, Barn Swallows, and Rough-winged Swallows. In the evenings, listen for Chuck-will’s-widows (often mistaken for Whip-poor-wills, a close cousin); these curious looking birds can be quite loud if close to your window! If you don’t have them disturbing your sleep, their song can be heard in the Bodie Island woods, patches of woods on Roanoke Island, and in Nags Head woods (and probably many other areas that I haven’t explored at night). While out at night, you may also hear a Great Horned Owl or an Eastern Screech-Owl. If you’re more of a beach person, there will still be plenty of willets and sanderlings feeding amongst the waves in April, and lots of gannets, cormorants and pelicans feeding in the ocean. Common and Red-throated Loons, Horned Grebes, scoters and Red-breasted Mergansers should still be available as well, especially early in the month, mostly migrating north, but some may be feeding. “More exciting, though, our terns arrive this month. Among the year-round Forster’s Terns, look for Least, Royal, Sandwich, Caspian, Common, and Gull-billed Terns, the last two being the last to arrive. Some will nest on ocean beaches and some on spoil islands. Along the shorelines and on the beaches, but especially in the mudflats, shorebird species begin to increase in April, especially late in the month. In addition to the common species that we’ve had all winter, look for newly arrived Black-necked Stilt, Wilson’s Plover (we hope), Piping Plover, Spotted Sandpiper, Solitary Sandpiper, Whimbrel, Stilt Sandpiper, Pectoral Sandpiper, and Semipalmated Sandpiper. Next month will be better for viewing these long-distance migrants. In back yards, April sees our beloved Ruby-throated Hummingbirds return. Wake those feeders from hibernation and fill with nectar (four parts water to one part sugar). No red dyes, please! Remember to clean them regularly. Any Red-breasted Nuthatches, Purple Finches, and Goldfinches that you had visiting your seed-feeders over the winter will probably have left by now, headed north to breed. Same with the ground feeders: White-throated Sparrows, Chipping Sparrows, and Dark-eyed Juncos will leave soon, too. I guess that means more seed for the Cardinals, House Finches, and Mourning Doves! 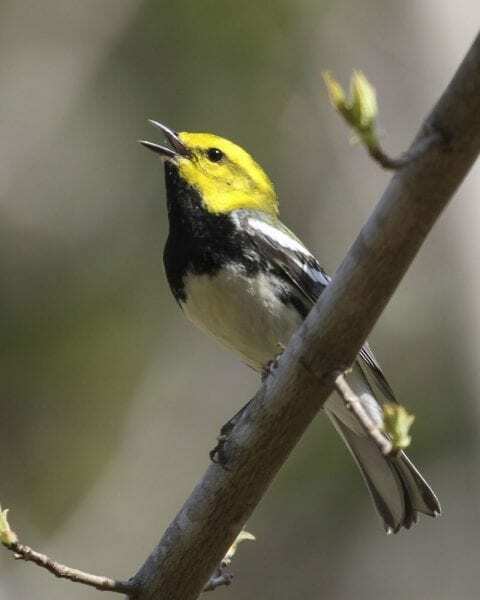 If you have good habitat in your yard, with lots of native trees and shrubs, and a clean, reliable source of water, you may get to see some really beautiful migrants as they head north to breed. If you’re lucky you may even hear their songs. Do yourself a healthy favor. Go outside, relax and enjoy the real world!